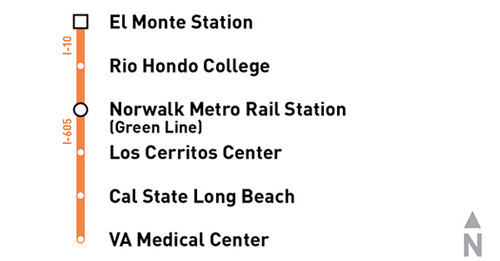 Beat traffic between El Monte and Long Beach and take Metro Line 577 to campus. With stops at Cal State Long Beach and now Rio Hondo College, plus connections to Metro’s Silver and Green Lines, Line 577 makes it easier than ever to get to school and around town. Even better, all full-time students enrolled in 12 units or more are eligible for a discounted Metro pass! To learn more and apply for a student discount TAP card, click here . Metro is pleased to be a part of Rio Hondo College’s Go Rio Program. All full-time students are eligible for a $7/semester transit pass, good for use on Metro, Foothill Transit, Norwalk Transit, Montebello Bus Lines, and more. For details, visit riohondo.edu/GoRio . Tip: Use Metro’s Trip Planner to get started, or view the 577 schedule .